This was the first movie my older son (age 4) has ever seen in a theater, and the first I've seen in a theater in a long time. He is obsessed with dinosaurs, so we thought it would be a fun first movie to see with his grandparents. The movie is rated PG, but based on this decent Forbes review where the author talks about his four-year-old son "cackling like an idiot and pointing at the screen in righteous approval." My son was actually more scared by the short (which I thought was great and very well done) than the movie itself. Review from a four year old boy (who is sometimes adverse to conflict): good movie, the pterodactyls and velociraptors were a bit scary, but not too bad. Review from his father: I'm a big softie, so this made me tear up a few times, but I agree with the Forbes review that it's not the peak of Pixar by any means. I'm glad it wasn't too much for my little guy, and I'd suggest it to others with young kids, though 5+ may be better. This was the first time I can remember ever being bored during a Pixar movie. It wasn't awful, but I was underwhelmed. There were some nice things: amazing bg work, nice feels at the end. But I really didn't need to see another critter/kid who needed to grow up lose track of his family and find himself on the way back. Not again. This is way better than dreck like Cars, but it's still lower echelon Pixar for sure. Maybe equivalent to say, Brave. That still makes it better than most kids' movies, so if you want to take the young'ns to the theater, you could do much, much, much worse. But if you go in expecting Pixar's normal ceaseless invention, you're going to be let down. I saw it Friday with my family. The story was nothing special, kind of paint-by-numbers animated family movie (it's no Inside Out). But visually, it's a technical achievement unlike anything I've ever seen. The water effects made Tangled look like Steamboat Willie. My favorite part of the movie (barring Sanjay's Super Team, which was fabulous) was the gorgeous, long landscape shots during the credits. It was basically just Pixar showing off. This movie is basically Finding Dino, but without the father/son dual protagonists. It's just a very slight story, and one that I expect will have little staying power. Crazy that Disney animation is now putting out better stuff (Big Hero 6) than Pixar. The scenery was incredible, but it's hyper realism made the cartoonish Dinos even more jarring to me. I saw this today with my seven- and almost -three-year-old. During the second encounter with the pterowhatevers, my two-year-old proclaimed "Enough! ", and I agreed, so we walked out. I figured the scary parts would be short, with implied, if any, violence, and that there would be more of a story, like Finding Nemo. Instead, it ended up being one damn fight sequence after another, and not much story in between. I did enjoy the scenery, but that doesn't really make it worthwhile. I haven't seen it and can't offer a review yet, but I do get the feeling Pixar isn't fully backing this one. I am not seeing anything like what I would expect to see in terms of advertising for this movie. Normally when a new Pixar movie is out, there is no way you don't know about it. On Thanksgiving I saw a review for this movie and I was like, "Wait, that's out NOW?" I saw it with my nephews, who loved it, but I was bored. I really hated the character design of Arlo and his family, especially compared with the amazing background animation; they didn't look like they belonged in the world. It's such a great premise -- what if the dinosaurs were never destroyed -- and the movie does nothing interesting with it. The storm-chasing dinosaurs were clever, and the reveal about what "the storm provides" was a genuinely scary twist. I linked a review in the sidebar that sort of explains why this felt so disappointing to me. The water effects made Tangled look like Steamboat Willie. One of the times Arlo gets out of the river and the water runs over him and drips off of him, it's amazingly realistic and beautiful. The animation might be the only reason I guess I'm glad I saw it in the theater. My seven year-old and I were both pretty underwhelmed by this. His review, "It could have been better." How? "By being less boring." I'm having trouble articulating why it didn't work for me. It just seemed thin, I guess. There were genuinely scary parts, but the stakes seemed to lessen over time, instead of increase. The same flooding that supposedly killed the Dad, was easily survived by Arlo and Spot. The first encounter with the storm-chasers was much more tense than the last one. Even the seven year-old noticed that Arlo made a habit of falling off of cliffs into soft foliage. It was cool to have the fake-out of the T. Rex's being friendly, but then the raptors(?) were a bit of a let-down. You have to go even bigger after something like that. And then he gets home and his Mom and his two siblings have already finished the harvest in time without his help. I am not always kind to Pixar movies, but I enjoyed this one a lot; it may be simply the gorgeous animation (that water made me gasp, I thought it was film footage for a second). The design; really odd. Like a toy dinosaur stuck in a photorealistic landscape. I adapted to it after a while, but that plus the lack of feathers on all but one dinosaur type was jarring to get used to. --they have agriculture! Also, presumably, private property? Human pioneers tended to build towns. Why wouldn't dinos? Where were the rest of the dinos? Herbivores are largely herd animals, but the only family group was the T-Rexs. This landscape is like "human-free North America with a few dinos sprinkled in" when there would have been many more smaller dinosaur species running around in the forests and prairies. --The chickens were enjoyably dino-like. Also: vestigial limbs on red cobralike snake? Sure, why the hell not. --How do you plow a field with the part of your head that has nostrils? Your nose would fill with dirt. -- At one point, Arlo is struggling to carry crops on his back. Even on a broad, strong back, this would be really inefficient. Meanwhile, building a drag/skid would make more sense. Even using a giant leaf/piece of bark to pull a load. --As much as they struggled to grow those crops, there is no way that size of fields would feed a family of beings that large. --The T-rexs built a fire. How did they do that? Do they carry flints with them? Didn't see any clothes/belts. In terms of animation, a beautiful movie. In terms of thinking through the world, it feels confused. In terms of story, I rather liked it; one reviewer thought Arlo didn't really move in a believable way from scared to not scared, but I think the steps were clearly signposted, usually when he was prompted by Spot, and in fact his final act of courage was entirely about Spot. Agree with many of the comments above, we didn't enjoy this one at all. Neither Miss6 or Miss3 lasted more than a half hour - too scary, and then too boring. Plus, tagging off emjaybee's suspension-of-disbelief problems; so, the humans have evolved enough to create clothing (and, obvious from the ending, kill and skin other mammals to make that clothing), but Spot spends about 3/4 of the flick barely using his hands, nudging stuff around with his head like he's got no thumbs? And they have no communication besides howling? I don't think I'm asking for hard-core SCIENCE, but it feels like the world-building never got much beyond "Dinos are like people, and we want Aldo to get a human as a pet, therefore humans are basically dogs", and they never really thought through how to make the world plausible enough to ignore the gaps. Yeah, I was really disappointed with the plot, how it was just "boy and his dog on epic journey". I also don't understand how falling in the river swept them downstream... Into the mountains? There are rivers that traverse mountains, but it's pretty uncommon for a river to flow from lowland plains into rugged terrain. Whatever. I also agree the depiction of Sauropod agriculture is lacking. Agriculture came about well into our tool-using era. We're supposed to believe these guys can make a complex trap, but not a pulling collar? These guys are basically their own draft animals, so even if they haven't gotten to the wheel yet they still ought to be pulling loads rather than carrying them. The damn family stuff made me blubber like a giant baby, even after they indulged in Disney Cliche #4: Traumatic Death of Dad. This is by far the most WTF movie I've seen in quite a while. I realize that kids' movies don't really have to make sense, but I felt like this just careened from one inexplicable thing to another. - The contrast between the (amazing) landscapes and the ridiculously cartoony characters never stopped feeling jarring to me. - "Here, son. If you want to earn my respect, go bash an animal to death with this stick." - The dinosaurs plow furrows in the soil with their snouts, but moments later they water the seeds with a tool they'd constructed somehow. - The T-Rexes galloped. On two legs. A la Monty Python. - Humans behave like dogs, yet they wear clothes. They have hands, but grab things by biting them. - Humans walk on four legs (which looks exactly as awkward as you'd expect) until the very end, when all the humans suddenly stand up on two legs and walk off. - The main characters (who are both little kids) go on a fairly extended drug trip which has nothing to do with the story. - The thing that killed Arlo's father happens to Arlo repeatedly. The second time is especially harrowing, Arlo is racing to save himself and his friend from a terrible fate. Then he fails and suffers a terrible misfortune but comes out fine for no good reason. It really just goes on and on. The next day I kept recalling little bits of the movie and thinking "holy crap, that really happened." My biggest beef, which I didn't really appreciate until I read some reviews from parents with small kids, was the casual and incessant violence. Totally outrageous given the age range they were presumably targeting. The most jarring is definitely the cute little mammal "rescued" and then summarily eaten -- and this was after the movie had established them as basically sentient. More generally, every character is intimately, uncomfortably familiar with death -- the specter of death really hangs over every scene -- yet they still talk light-heartedly about killing one another, and frequently do. 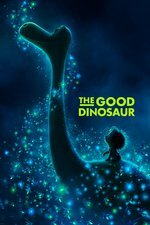 How “The Good Dinosaur” Raised the Bar for Natural-World CGI -- a short Wired video on how Pixar made the ultra-realistic environments and landscapes, which made me want to own the movie just so I could watch it and enjoy the ultra-real Wyoming, and the other Making Of clips on the Blu Ray. Sadly, I still don't care much about the plot of the movie.